You'll be £14.99 closer to your next £10.00 credit when you purchase Tracing Your Georgian Ancestors 1714-1837. What's this? Order within the next 3 hours, 43 minutes to get your order processed the next working day! 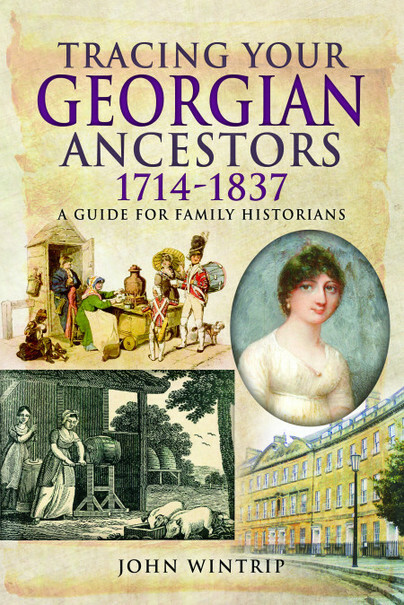 The Georgian period – 1714 to 1837 – was a key stage in our modern history so some understanding of it is essential for family historians who want to push their research back into the eighteenth century and beyond, and John Wintrip's handbook is an invaluable introduction to it. In a sequence of concise, insightful chapters he focuses on those aspects of the period that are particularly relevant to genealogical research and he presents a detailed guide to the variety of sources that readers can consult as they pursue their research. While fewer sources are available than for more recent history, obstacles in the way of further research can often be overcome through knowledge of a wide range of sources and a greater understanding the historical context, together with the use of sound research techniques. So the author provides not only a historical overview of relevant topics but he also describes the records of the period in detail. This expert guide to researching the Georgians will open up the field for experienced researchers and for newcomers alike. For those wishing to trace ancestries back to the early 18th century, a useful and concise reference work for research in the century prior to civil registration and census returns. The book sets this era in historical context and provides an opportunity to discover the location of sources and learn how to use them effectively. An excellent book that not only offers a valuable perspective on a frequently overlooked century, or so, of English history, but also signposts the wealth of resources available to family historians trying to take their research back to a period pre-dating Civil Registration and the National Censuses of 1841-1911. A very worthwhile addition to any serious genealogist’s bookshelves. 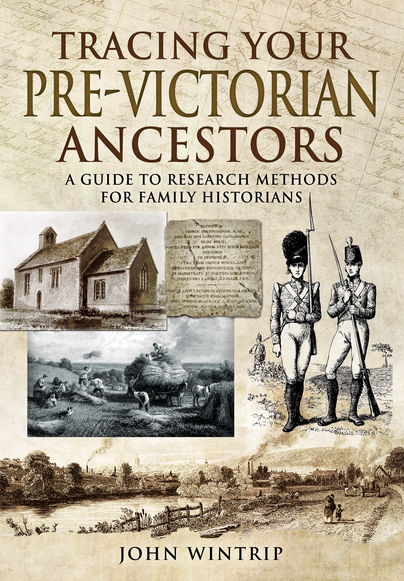 Although it is not apparent from the title, this was conceived as a companion volume to the author’s Tracing Your Pre-Victorian Ancestors, A Guide to Research Methods for Family Historians, 2017. While the earlier volume concentrated on methodology, this one outlines the main sources that researchers will need to tackle. Both books are much needed in an era when digitisation means that family trees can be explored back to around 1830 in an evening. Not long ago the same process might have taken several years and could not have been achieved without some knowledge of sources and repositories. Now many people have little idea how to embark on research in earlier periods. John Wintrip gives clear and detailed advice on carrying out genealogical research before 1851. An invaluable guide to family research. ★★★★★ I pre-ordered this book after reading the same author’s Tracing Your Pre-Victorian Ancestors, which focuses on research methods. This new book focuses on sources and the historical background, so the two books complement each other very well. I would highly recommend this book to all family historians who take their research seriously and are prepared to go that extra mile to track down their Georgian ancestors. Although I have been researching my own family history for many years, I found many useful snippets of information in this book, and was also reminded of things I had once known but had forgotten. Although aimed at the family historian there is plenty for the more general historian. I learned plenty: the male naming conventions in families (and why it can be so confusing), why Mr Bennet and Mr Collins have different surnames despite being descending through the male line from the same ancestor, the way the swap over from the Julian to the Gregorian calendar worked are just a few examples. I will certainly be referring to this book when stuck on how to find some of the scads of people who crop up in my research for this blog or my book projects. Pen and Sword's magnificent library of self-help books for genealogists continues with one of the most fascinating periods in our history - over a century of Georgian reign. John Wintrip suggests a whole host of records that might be available to people researching this period, places you might not have even thought ot. This series goes from strength to strength. The admirable skill of presenting a wide ranging body of complex information with clarity is demonstrated in this review of the many sources useful to family historians. The historical context of the documents available for the period preceding the 1841 census and 1837 registration adds greatly to our understanding as does the description and explanation of the nature of sources from military records to wills. We benefit from the author’s advice and his assessment of the usefulness of the records available together with where and how to get access to them. This is a valuable introduction to research in a key stage of British history, a period when fewer record resources are available than for later times. I don't think anyone who buys this book will be disappointed, whether they're a beginner or a more experienced researcher. It concentrates on documents available between 1714 and 1837 and groups them in a useful and readable way, emphasising which ones are likely to contain genealogical information. John Wintrip provides a treasure trove of information on sources available for tracing ancestors in Georgian England. The book is primarily intended for those researching in England & Wales; there are a few references to Scotland and Ireland, but in the context of records that might be found there which relate to inhabitants of England or Wales. If you have English or Welsh ancestors this book is well worth buying. John Wintrip became a professional genealogist following an earlier career as a science librarian in universities. He was awarded a Diploma in Genealogy by the Institute of Heraldic and Genealogical Studies (IHGS) in 2008, has been a member of AGRA since 2009, and has carried out research for many clients both in the UK and overseas.